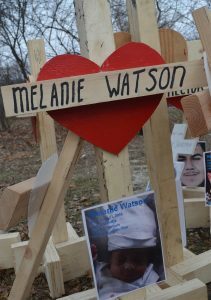 Some of the 3-foot tall crosses made by Auroran Greg Zanis feature photos and names of individuals murdered in Chicago in 2016 as they await family members of the deceased to retrieve them. The backyard of Greg Zanis’s Aurora home has become a temporary resting place for hundreds of wooden crosses. Some of the 3-foot tall crosses feature photos and names of individuals murdered in Chicago in 2016 as they await family members of the deceased to retrieve them. Some of the crosses include age, occupation, cause of death of the victim was well as hand written messages. Zanis has been receiving up to 30 phone calls phone each day from relatives of victims murdered in 2016 following a recent Michigan Avenue march designed to draw attention to the carnage in Chicago. Many found out about the march and the crosses after seeing coverage on television, according to Pastor Manny Rivera of Aurora’s Restoration Church. Now some relatives of the slain hope to claim the cross of their loved one. This is the aftermath of Zanis’s latest and most ambitious undertaking. For more than 20 years, Zanis has built crosses in memory of victims of shootings and rampages and delivered them from his Aurora home sometimes thousands of miles to locations like Columbine, Colo., and Newtown, Conn. to honor those individuals who died under tragic circumstances. On New Year’s Eve, the more than 750 crosses all made by Zanis were rested on the shoulders of marchers—some were family and friends of the deceased and others knew none of the victims—who joined together with local dignitaries such as St. Sabina’s Father Michael Pfleger and Rev. Jesse Jackson as they marched down Michigan Avenue with a goal of calling for an end to the violence. All the crosses have red hearts in the middle, something Zanis said he began doing after placing crosses at the site of the Boston Marathon bombing in 2013. 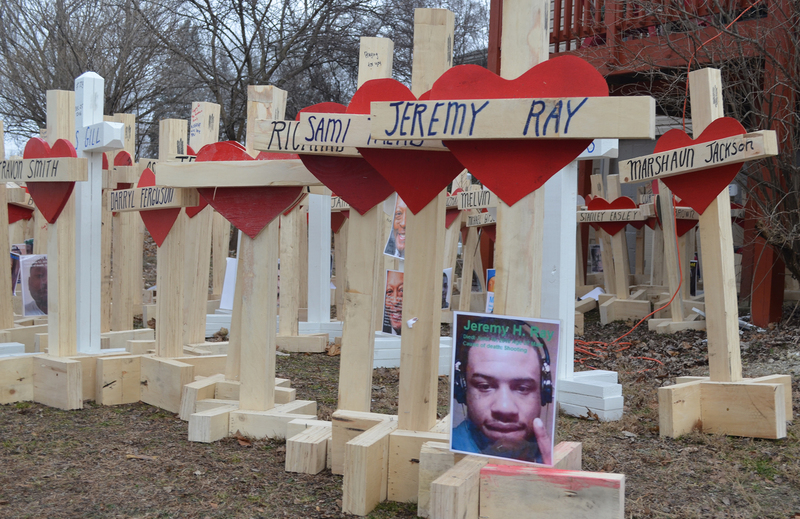 Each year, Zanis said he places hundreds crosses in Chicago. Zanis said upon his return last June from Orlando where he placed crosses to honor the 49 people killed at the Pulse nightclub, an anonymous individual came forward with a donation of a vacant lot in Chicago and another donor gave a large lumber donation. The name of one of Chicago’s victims of violence in 2016 appears on one of the crosses made by Greg Zanis. 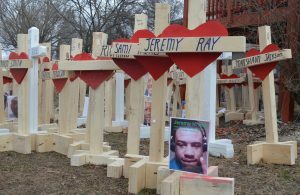 Initially, Zanis planned on using the vacant land to place crosses honoring individuals killed in Chicago in 2017. However, Zanis said Pfleger heard about Zanis’s plan from a newspaper article and reached out to him to build the crosses for the victims who died in2016.Zanis and Pfleger have a long history. 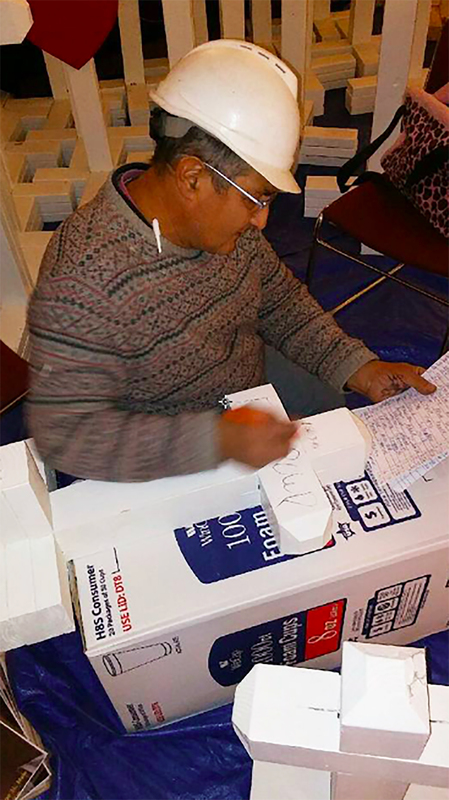 As he made the crosses, Zanis loaded them in his truck and stored them temporarily at Aurora’s Restoration Church. On Dec. 30, the crosses were displayed at a candlelight vigil at the church where Pastor Manny Rivera called for an end to the violence. Rivera became friends with Zanis through a fellow parishioner at Restoration Church. “The crosses are an important symbol of the tragic violence that exists and hopefully a statement that will make people stand up to end the violence,” Rivera said. Retired after years of building custom homes and restaurants in the Fox Valley area, Zanis said he first began to make crosses after his father-in-law was murdered in1996 just two blocks from Zanis’s current home. “He was my best friend,” Zanis said. The same year, a six-year-old Nico Contreras was murdered in Aurora. “His mom asked if I would make a cross for her son and within a week, I had made 15 homicide crosses here in Aurora,” Zanis said. The following year, Zanis said he made crosses to honor three Waubonsie Valley High School students — Allison Matzdorf, Jennifer Roberts and Jenni Linn Anderson — and Anna Louisa Pryor, an Aurora mother of three who died in a drunk driving accident. Aurora carpenter Greg Zanis looks over the list of victims of violence in Chicago in 2016. Zanis made crosses to honor each of the victims. In 1999, Zanis made crosses to honor Emily, Thomas and Nicholas Lemak — three young Naperville children who were murdered by their mother Marilyn Lemak. Estimating he has built 16,000 crosses in total since his retirement, Zanis has increased the number he has built each year from 700 to about 1,500. However, at events like the New Year’s Eve march in Chicago, Zanis said he chose not to speak so that families would not question the motivation behind his work. Likewise, instead of taking photos of himself for this article, he suggested photos be taken of the crosses. “As a facilitator and a carpenter, I am not trying to do public speaking. I am doing this for the victims,” Zanis said.